Model 2006 Lifting Belt features our 3 patents including a one-way velcro closure, a downward angle to fit the natural shape of your back and a hip and rib contour for added comfort. The 2006 belt is 6" wide in the back and slighter wider on the sides and abdominal area than our 2004 belt. Weight belts are an optional piece of equipment. There are many theories as to whether you should wear a belt or not. Some lifters believe weight belts give you support, both physically and mentally, while others believe belts take away from development of the lower back and core strength. If a belt gives you a psychological edge allowing you to lift heavier weights, then by all means use one. Just don't wear one while doing cardio! But, if you depend on the belt 100% of the time you are never going to build the muscle needed to support your lower back. Weight lifting belts are designed to ASSIST in stabilizing the midsection; it does not DO the work for you. I believe a belt should only be used on the really heavy sets. I have tried leather belts, two prong and single prong, nylon belts, either a 4" or 6" with Velcro closures. The leather belt cut into my sides, and I could never get it tight enough, I was always one hole off. The Velcro fastened belts were way easier to tighten, but still didn't feel right. Until I tried a Schiek weight lifting belt. Schiek belts form a cone shape essential for the perfect fit. All other belts create a cylinder and do not fit your body properly. You need to wear a belt that has a conical shape like that of a funnel. Conical belts maintain proper alignment of the spine when lifting. The new hip and rib contour provides ultimate comfort and flexibility. Ordinary belts dig into the hips and ribs and cause discomfort. The one-way Velcro allows belt fastener to slide in one direction only for quick and exact fit. Unlike belts with buckles, the Schiek belt can be easily adjusted to the perfect tension during a workout. A special lumbar insert reinforces the natural shape of the spine. Other nylon belts flex in this area where additional support is needed. Schiek belts are designed to support BOTH the lower back and abdominal area. I wear my Schiek belt during heavy squats, deadlifts, standing shoulder presses and bent over barbell rows. The best thing I like about Schiek belts...they are MADE IN THE USA! Studies show that wearing a belt while lifting weights increases intrabdominal pressure by up to 40% and reduces compression of the intervertebral discs by 50%, which suggests that lifting belts can help prevent weight training injuries (patuclarly the back) and aid muscle strength. Other studies report that rep speed on the squat was almost 10% faster when subjects wore belts, indicating that weight belts can hep increase power and strength. Although some claim that wearing a belt will reduce core muscle strength, research shows that a weight belt helps increase the activity of the abdominal muscles by about 10% and the spinal erectors by about 25%. Wearing a belt may actually increase core developement, not hinder it. Our advice: Use a lifting belt on only heavy sets, especially on exercises that load the spine. The shipping was prompt and the belt I purchased was in new condition. This company gives you a personal touch with each order. I have owned numerous other weightlifting products/aids, but have now found the product line I'm sticking with for good. Thanks to the crew at Schiek for producing these fine products. To anyone who is serious about weightlifting, I strongly recommend you try a Schiek product. You won't be disappointed. Justin M.
"The 6 inch Schiek 2006 leather weight lifting belt works GREAT. The 6 inch back support gives you all the support that a weight lifter needs. I would recommend this product top of the line." Steve W.
Love the belt! Excellent abdominal support as well as back support. Tim O. This belt is an excellent asset to my studio. Kay D.
Very comfortable, well built, and made in the USA. Leif L.
I'm a 53 year old, 6'4" 300 lb police officer who patrols on a jet ski. 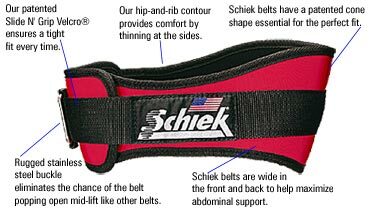 I had back surgery in 1983 and I have used weight lifting belts ever since with Schiek being the best I have ever used! I love the fit. Larry H.